We had an early celebration for Shern last weekend. Just like all the previous years, I'd decorate his birthday cake, just like his 1st, 2nd, 3rd, 4th and 5th birthday cakes. Reason being is that nobody in my house fancy fondant cakes, and also it is much cheaper to just buy a normal cake and then decorate it yourself. 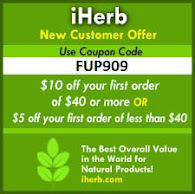 It costs only a fraction of the price, really. And best of all, it is a one-of-a-kind birthday cake that you remember and treasure. I ordered 2 dozen of my favourite cupcakes from our friend Shallyn from Yours Truly and so decided to just go for a small cake this year. Bought a 1/2kg cake from Sunflower Bakery, chocolate cake (Shern's favourite) of course! All I did was to wash the Lego pieces and then stuck them on the cake. Easy-peasy. 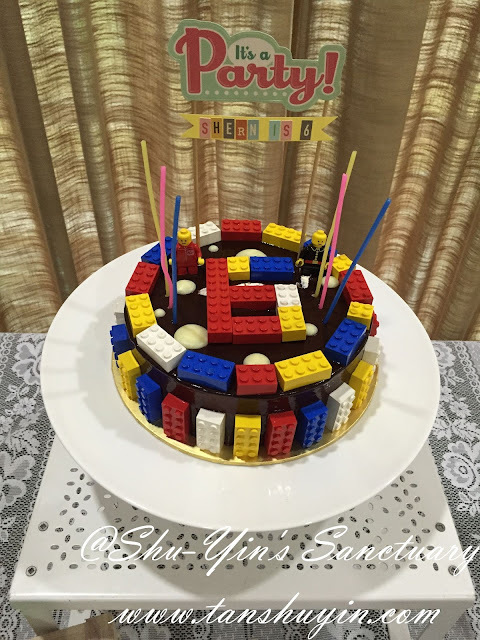 I arranged the Lego pieces all around the top part of the cake. Then stuck more Lego pieces vertically all around the sides of the cake. 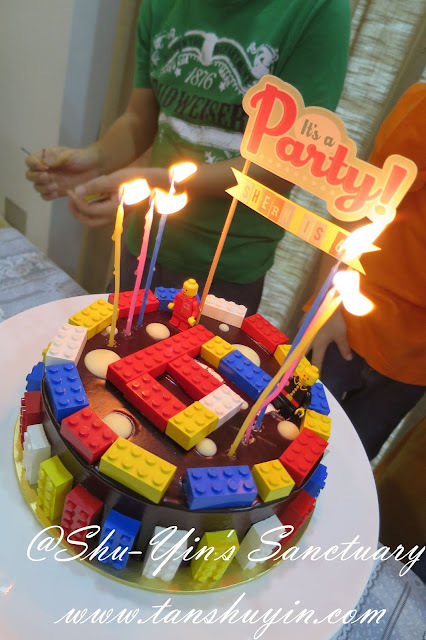 Did a number '6' using Lego pieces on top of the cake as well as placed 2 Lego Figurines on it. And I did a mini 'It's a Party!' banner and also one that says 'SHERN IS 6' to give the cake some height. And lastly stuck 6 long, thin candles on the cake! And voila! 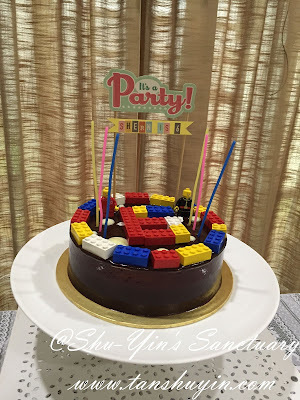 I transformed a plain looking cake into this - a One-Of-A-Kind Lego 6th Birthday Cake for Shern. This is how the cake looked like when it was all lit up! And Shern was happy with the cake, which is what matters most. 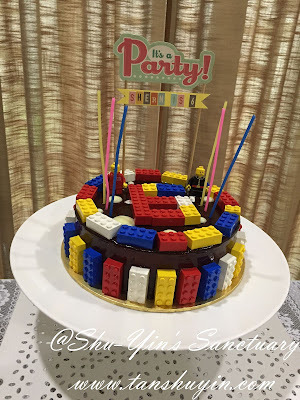 Another awesome One-of-a-kind Lego 6th Birthday Cake for Shern! For those of you who wants to have an awesome and unique cake for your child, give it a try! It is easy to decorate your own cake. As simple as it is, it takes a brilliant mind to come up with the idea. As much as I enjoy planning my own birthday parties for my kids, I always fall short in the cake department. I shall consult you the next time round! I never spend a few hundreds on cake, coz the money saved I can use it to buy all the other party food. So is really much cost-saving to buy a normal cake (for this case, costs me rm38 only) and deco it myself!